Wawona Campground, in the southern part of Yosemite National Park, offers a quiet place to camp out, a number of amenities and time to enjoy many nearby sights and attractions. Book Online. Wawona Campground Yosemite is open year-round, giving campers an up-close and personal experience in Yosemite’s beauty. You’ll have a picnic table, fire pit and drinking water. A small stream runs close by with its bubbling sound lulling you to sleep at night. Wawona Campground Yosemite National Park is close to Wawona off Highway 41. From the southern entrance, drive one mile past Wawona to the access road and turn left to the campground. 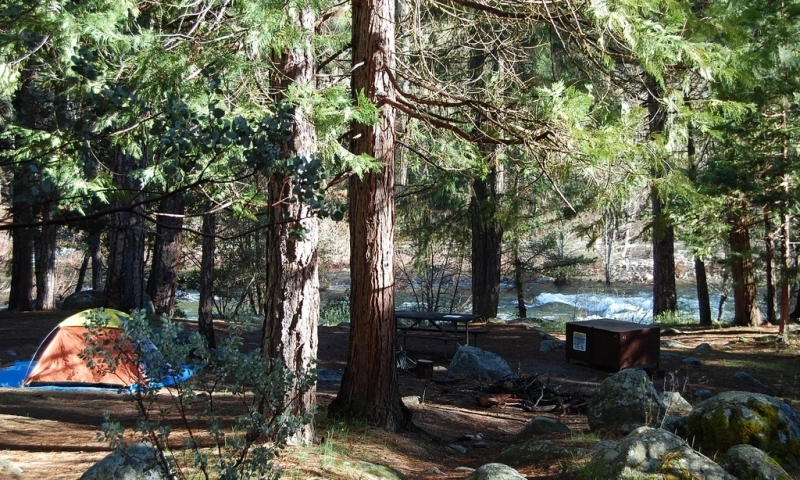 During April through October, reservations are required for Wawona camping. The rest of the year, sites are on a first-come, first-served basis. To make reservations, call 877-444-6777 or Book Online. Is there a dump station? In the summer one is available on Forest Drive east of the Wawona. Yosemite Wawona Campground is close to a number of attractions and activities that will be enjoyed by the whole family. The scenery of Yosemite is impressive in itself, but how many people actually know the history of the park? The Pioneer Yosemite History Center provides a unique look at historic structures from different eras, preserving these buildings for generations to come. Among other structures, you can view John Muir’s cabin and Cedar Cottage (built in 1859 and the oldest structure in the park). From Wawona, you can ride the shuttle to the Mariposa Grove. Here you’ll see Giant Sequoias, towering above. Take a walk through the largest grove in the park to view the walk-through California Tree and the Grizzly Giant that is at least 1900 years old and the 25th largest tree in the world. When staying at the Wawona Campground, you’ll find a number of hiking trails in close proximity, giving you access to special reaches of the beautiful wilderness in Yosemite. An easy 3.5-mile loop is the Wawona Meadow Loop, taking you on both paved and unpaved roads around the meadow. The Swinging Bridge Loop is another easy trek, 4.8 miles of lovely views. Another moderate 6-mile hike will take you from the Wawona Hotel to the Mariposa Grove.